MailChimper PRO is a WordPress MailChimp Form Plugin, that support MailChimp along with many more other providers. 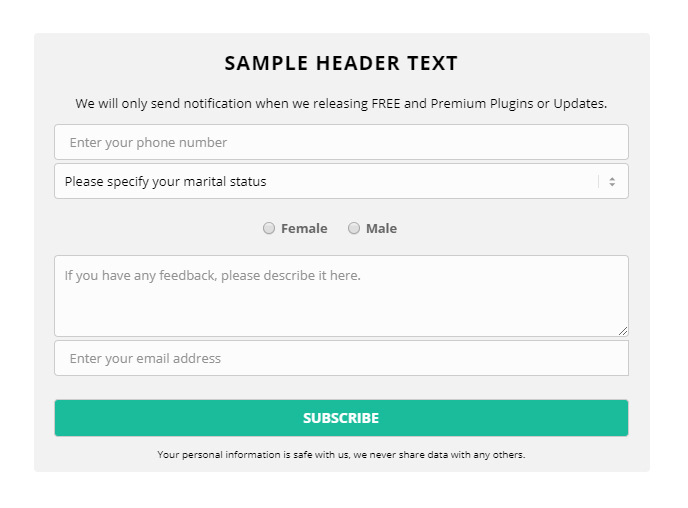 Gives you the ability to collect the visitors email address with this fancy, attention grabber newsletter subscription form, then directly pass the data to your MailChimp list. The signup forms are easily and fully customizable and you can translate all texts on it. By default, you will get a ready subscription form, just you have to fill out with your email address or MailChimp ID. Provides professional, quick solution to start building your MailChimp email list in minutes. You can use it with MailChimp, but if you have any other newsletter database manager, you can use it with that as well. In that case, the plugin will send you a message about every newsletter subscription with the user’s email address, therefore you can easily add it to your own email list manager. You can also use this function as a signup notification. It is also possible to connect to Active Campaign, Benchmark, Campaign Monitor, Campayn, Constant Contact, Freshmail, GetResponse, MailPoet, MyMail, MadMimi, SimplyCast and YMLP. In this case the plugin will automatically pass the subscription details to your existing mail list and the user will be subscribed without any further interaction. The Visual Builder allows you to design your own MailChimp subscription forms easily. Choose from more than 650 Google Font Styles, set the font-sizes, font colors, animations, borders and much more. Provides different animations combined with different positions to make really unique, stunning signup forms. Live Preview gives the ability to view the designed forms directly while editing. Offer popup and embed styles with custom fields. You can include simply an email only subscription form or create advanced signup area with many of custom fields. The available custom fields cover all possibilities to create any subscription form, including text inputs, textareas, radio buttons, select boxes and even hidden fields. When you using the plugin with popup mode, it can be displayed on your entire website or on a specified pages only. This way you have the total control over the marketing opportunities to create your own campaign effectively. The embed mode helps to absolutely blend the subscription area with the content, therefore the visitors will subscribe more likely. Quick Youtube integration. Short video can tell much more than thousand words, why don’t use it in the subscription forms? The plugin provides a really easy integration with your YouTube videos to increase the subscription rate dramatically. The video fill out the popup and will be displayed in a professional, elegant way. The input field is displayed in front of the video, the visitors can easily subscribe to your mail list while playing the YouTube video. Social integration gives you the power to avoid email misspellings and the subscription can be done much more easier for your visitors. Clicking on the Facebook or Google Plus sign up allows for your users to get their email address directly from the social network and they don’t need to fill out the email address field. With this feature, you can be sure the subscriber email address is valid, because it has been already validated by the chosen social network. Furthermore, it is much more comfortable for the visitors instead of typing their email address. Special animations, unique forms. However, the animation is only optional, it is highly recommended to use that. The most visitors like the new, modern websites and it will gives more professional experience for your website. The plugin offer main animations, that will set how the popup will be displayed on the screen. With configuring this animation type, you can set the position and the animation style. The special result can be achieved by the item effects, that will animate all elements in the popup. As a result, you can provide a fully animatied, living subscribe option to your visitors in an unobtrusive manner. More than 200 animation types can be achieved with combining the main animations with the item effects, using the latest CSS3, hardware accelerated technology. Various predefined templates helps you to save time and get the best form design on your site. However, the Signup Form provides a Visual Builder to design your custom forms, it contains several sample styles to save your time. Connect with Google Analytics is a core feature of MailChimper PRO for WordPress. That means, it is able to connect to your Google Analytics Account and track the subscription forms’ views with Google Analytics Events. The integration is only few clicks, then you can see the forms’ views and entrances (unique views) in the stats. You can also disconnect your Google Analytics Account anytime. Provides many informations about the subscription forms and subscribers by dates, links or forms. Google Analytics can extend the stats with Form Views and Entrances (Unique Views) to get more feedback about the effectiveness of your subscription forms. Possible to export the result to CSV, Excel, PDF, simply copy to the clipboard or get a clean page for print view. The entire stats are searchable and sortable with AJAX based pagination. The form view of the stats provide complete information about how your subscriptions perform. Track your marketing strategies and see how many subscribers you got from each form on a pie chart. The date view of the stats show how the MailChimp subscriptions perform in a specified date period. The success can be different on the weekdays or on the weekends, therefore this stat will help you to timing your marketing campaign in the best timeframe. The link view of the stats display the subscription rate by webpages. It is important to create pages that blends well with your subscription forms. This result can tell you if any of your subscription page perform better or less better than others. The fields can be set as required and it is also possible to specify minimal character length and custom warning message for each custom fields. As it has mentionied, the plugin provides a visual builder, that allows to set your own style. If it doesn’t enough, you can do more customization through the Custom CSS page on the WordPress admin. This page allows you to add custom CSS code, that will be integrated on the frontend area. This way, you can customize anything with a minor CSS coding knowledge. 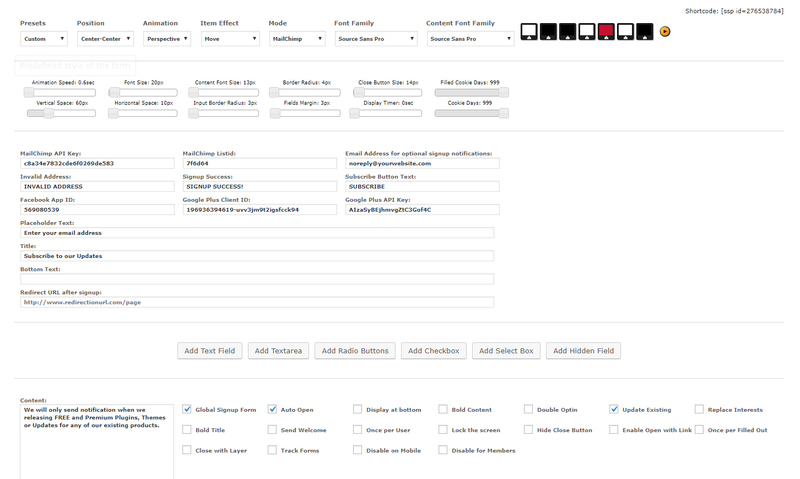 This feature has been added specifically for designers and developers to create unlimited variations and styles. MailChimp is one of the most popular service provider to manage your email list. The plugin can be integrated with your MailChimp Account, just you have to specify your MailChimp API Key and MailChimp List ID. Find detailed information in the documentation about how to get easily these details. After you defined both of them, each signup will be passed directly to your MailChimp List. View your subscribers directly on your WordPress admin. With enabled stats, the plugin collects the subscribers, therefore you can check and export the entire mail list. It is possible to delete entries, that older than 30 days or delete all subscribers from the list to keep it clean. This list is not connected with the Newsletter APIs, therefore you can use it as a quick note about the last signups. Popular marketing strategy to automatically redirect the browser to a specified page after a successful subscription. The plugin able to do this with simply specifying the redirection URL on the WordPress administration page. This method allows you to control the visitor’s attention and display important pages for them. Works with AJAX technology, therefore it doesn’t use any page reloading on the frontend area. The popup and the embed mode process the subscription data in the background, therefore it is works really fast without reloading the actual webpage. Additionally, this method grants the security against the spamming robots, since the form can’t be submitted automatically. Use any number of the newsletter forms on the same or different pages. You can even use one in the footer or in a widget via shortcode in embed mode. However, WordPress Multisite is completely supported, you need one license for each website you would like to use on. In this case, you have to create the subscription form one time and it can be applied to all of your multisite websites. From version 1.8.1 the plugin name changed to MailChimper Pro. Existing users simply copy the new update from the ZIP to the wp-content/plugins directory, then delete the simple-signup folder and activate MailChimper PRO on the plugins page. All data will be remained. Alternatively, it can be also done on the admin area. Just turn ON the Keep Settings option in the General Settings, deactivate and delete the plugin, then install the new version. Check out the changelog here. After you purchased go to the Downloads and set the checkbox to on. You can also rate the plugin there. If you have any question or feedback, please feel free to email me via my user page contact form. You can also check the Support Forum, the issue maybe has been solved before. The plugin’s FAQ also contains some useful informations. Would you like to include this plugin into your theme? Purchase one extended license for each theme you want to sell on any Envato Marketplaces. Drop me a line via my profile page mail sender and I will add your theme link to this page. Before you send a refund request, please make sure you already contacted with the support here and provided your website’s URL. If the plugin doesn’t work as it described and the problem is with the plugin, that can’t be fixed in 48 hours, then you can get a full refund. If you refusing the free support and the issue can’t be investigated, then you can’t get a refund.